China and Portugal pledged Wednesday to jointly push forward the construction of the Belt and Road to strengthen Asia-Europe connectivity and boost global trade. 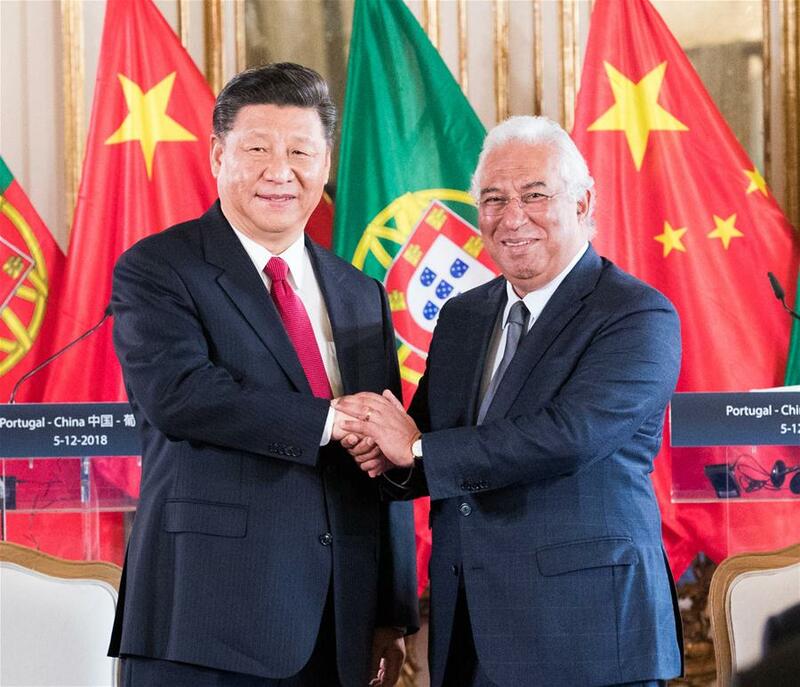 The consensus was reached during a meeting between visiting Chinese President Xi Jinping and Portuguese Prime Minister Antonio Costa. After the meeting, the two leaders also witnessed the signing of a memorandum of understanding between the governments of the two countries on jointly advancing the construction of the Belt and Road. During the meeting, Xi said that since Prime Minister Costa's official visit to China two years ago, the important consensuses reached between the two sides have been translated into concrete results of cooperation, as two-way trade is showing sound momentum of growth and the investment cooperation in key areas is making smooth progress. The China-Portugal relations are entering the best period in history and presented with new opportunities for development, Xi said. China is willing to work with the Portuguese side to elevate their comprehensive strategic partnership to a higher level, the president said. For the next phase, Xi noted, the two sides should increase high-level visits as well as exchanges at all levels and in all areas, and work together to push for more practical results through jointly promoting the Belt and Road Initiative, thus playing a positive role in strengthening Asia-Europe connectivity. He proposed that two sides expand cooperation in finance, investment, aviation, automobile and new energy, advance the implementation of more cooperation projects, and explore third-party markets to achieve benefits for all. He also called on the two sides to enlarge cooperation in culture, education, tourism, science and technology, and medicine. On international affairs, Xi said that the two countries should increase coordination and cooperation, promote trade and investment liberalization and facilitation, and jointly oppose protectionism and unilateralism. He also expressed the hope that Portugal could continue to play a positive role in pushing forward the China-Europe relations in the right direction. On his part, Costa said that President Xi's visit is of great historic significance. He said that Portugal and China have had a long history of traditional friendship and built good mutual trust. The Portuguese side thanks China for its support in helping the country maintain its financial stability, Costa said, noting that Portugal stands ready to take this visit as an opportunity to join hands with China to elevate the bilateral relations to a higher level. He said that Portugal upholds openness, cooperation and free trade, and is willing to actively participate in the Belt and Road Initiative, as this initiative can not only help enhance friendship and cooperation between the two peoples, and promote trade and investment between the two countries, but also help strengthen Asia-Europe connectivity, partnership and trust, and boost global trade, thus delivering benefits to people of the world at large. Portugal stands ready to boost cooperation with China in infrastructure, finance, automobile, and science and technology, he said. Chinese businesses in Portugal abide by local laws and regulations, Costa said, noting that Portugal welcomes China to invest in the country and increase production and manufacturing here, and hopes to expand third-party cooperation with China in Africa and other regions through the Forum for Economic and Commercial Cooperation between China and the Portuguese-speaking Countries. Portugal expects to increase communication and coordination with China in tackling climate change and other global affairs, and jointly safeguard multilateralism, he said. Portugal is willing to play a greater role in enhancing Europe-China mutual trust and cooperation, he added. After the meeting, the two leaders met reporters. Xi said that his visit has been fruitful and a complete success, injecting fresh, strong impetus into the China-Portugal comprehensive strategic partnership. Portugal is the final stop of Xi's Europe and Latin America tour, which also took him to Spain, Argentina and Panama. In Buenos Aires, Argentina, Xi also attended the 13th Group of 20 summit. Xi told reporters that through the trip, he deeply felt the good wishes and ardent expectation of the world people for global peace and stability, and national development and prosperity, as well as a happy life and work for their own. Despite various issues and challenges the world is facing, Xi noted, China will always uphold the principles of mutual respect and equal consultation, and pursue peaceful development and win-win cooperation, so as to work with all other countries to jointly build a community with a shared future for humanity. The two governments signed a series of cooperation documents after the meeting between the two leaders, including the memorandum of understanding on the Belt and Road Initiative and another one on science and technology cooperation. The two countries also issued a join statement on Wednesday, pledging to further strengthen their comprehensive strategic partnership as they celebrate the 40th anniversary of their diplomatic ties next year. To celebrate the 40th anniversary of their diplomatic relations, China and Portugal decided to hold cultural festivals at the other side in 2019. They also agreed to provide mutual support in setting up cultural centers. The two sides will strengthen their Blue Partnership to facilitate marine cooperation and grow marine economy for their own countries, according to the joint statement. The two countries will also jointly push for the launch of more direct flights, it said. They agreed to start negotiations for a bilateral social security agreement in the first half of 2019. Portuguese President Marcelo Rebelo de Sousa will attend the second Belt and Road Forum for International Cooperation to be held in April 2019 in Beijing and pay a state visit to China at the invitation of President Xi, the joint statement said.